For owners of the current Surface Studio, there is clearly a lot to like about this update, with performance improvements in almost all categories. However, those improvements may not have a shelf life befitting of such an expensive computer. We’ve waited quite a while for this one: the Surface Studio 2 is finally here, and it’s improved in almost every way. However, those improvements may not have a shelf life befitting of a computer with such a steep price tag. For folks that have already bought into the Surface Studio platform, this new edition should come as a welcome, long-awaited upgrade. Just be sure that this computer will be ideal for your use case (digital media artists only need apply) for some time before plunking down this much cash. For the Surface Studio 2, you’ll need to drum up at least $3,499 ($5,499, about £2,680) to get in on the ground floor. This gets you a 7th generation – no, that’s not a typo – Intel Core i7 processor designed for laptops backed by Nvidia GeForce GTX 1060 (6GB GDDR5 memory) graphics, 16GB of DDR4 memory and a 1TB NVMe SSD. Yes, the hybrid drives are no more. This all sits behind – or rather beneath – a 28-inch, 4,500 x 3,000 resolution PixelSense display that’s now 38% brighter (515 nits) and with a 22% higher contrast ratio (1,200:1). 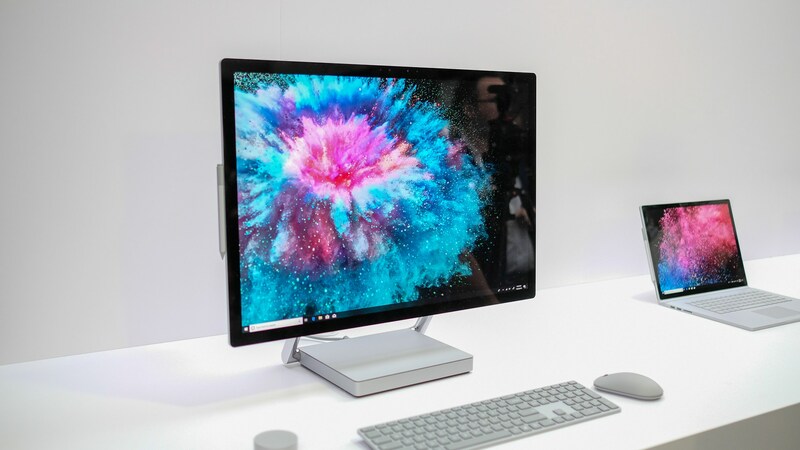 As for upgrades, the Surface Studio 2 can support GeForce GTX 1070 (8GB GDDR5 memory) graphics, up to 32GB of DDR4 memory and as much as 2TB of SSD space. The processor option remains the same throughout. It’s difficult to compare this product against competing all-in-one PCs for creatives and otherwise, as it remains intended for an incredibly specific audience. However, we do know that Microsoft has upped the starting asking price by 500 bills for parts that, while a major improvement over the first Surface Studio, are arguably dated by today’s standards. All in all, it’s difficult to say what price can be put on such a specific niche product with no benchmarks to compare it against, but this is an expensive piece of computer no matter how you shake it. 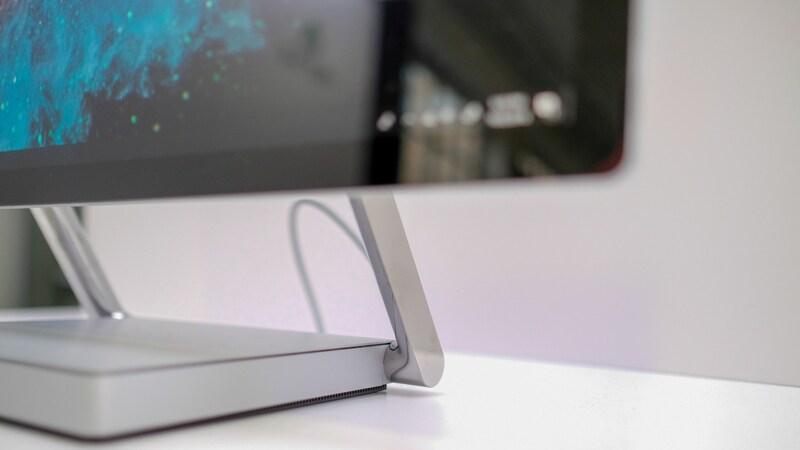 This may turn out to be a rather short section, as absolutely nothing has changed about the Surface Studio in its physical design in the upgrade to Surface Studio 2. Even the included wireless keyboard and mouse are identical. However, it would have been welcome to see that starting price hike further justified with a full array of USB-C 3.1 ports or – even better – Thunderbolt 3, especially given this device’s potential to act as the hub of your desk. Also, why couldn’t this product have received that jaw-dropping, all-black color palette? Imagine how that would bounce off the chrome accents and just disappear behind your work. 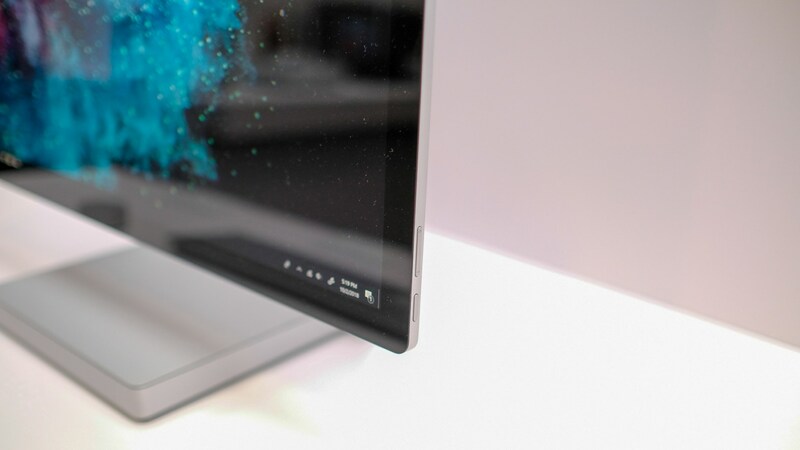 Naturally, we’ll refrain from making any hard judgments here, but our first impressions of the Surface Studio 2 power profile are … concerned. You see, the components listed above may be a sizable improvement over the previous model, but they’re rather behind current standards – particularly the processor. Today, we have the second and third round of 8th-generation, mobile Intel processors widely available for use, even with beefier ‘H’ and ‘B’ series chips. While you may not necessarily feel this datedness when using the Surface Studio to illustrate and edit media, you may when trying to export or encode those projects. Microsoft has admittedly improved the storage on offer massively by removing the hybrid drives in lieu of dedicated, NVMe SSDs. However, what we’d hate to see is the processor now become a bottleneck for productivity, but that will only show itself in a full review. Right now, the bottom line is that Surface Studio 2 is a marked improvement upon the previous model is nearly every way. 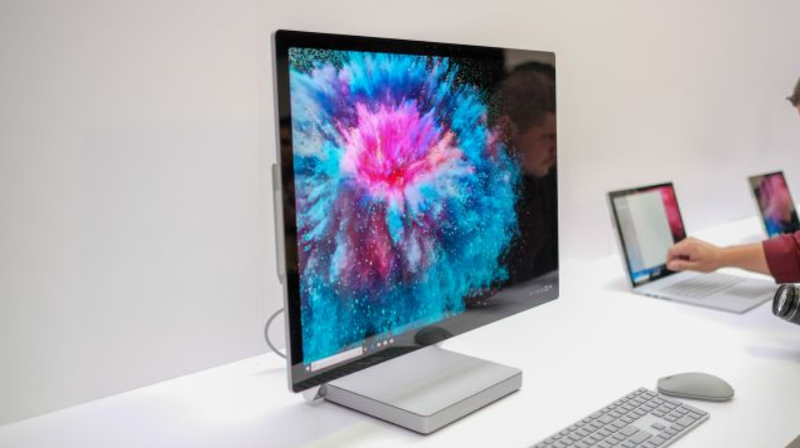 Microsoft has iterated on the Surface Studio in some of the most impactful but also minimal ways, while upping the starting asking price by a considerable amount. So, you can understand our ambivalence regarding the Surface Studio 2. For owners of the current Surface Studio, there is clearly a lot to like about this update, with performance improvements in almost all categories. However, it’s important to note how far behind this product is in general processing out of the gate, and will likely soon be behind again in graphics once Nvidia’s mobile Turing class chips release. This puts that arguably sizable price tag into important context. It’s normal to expect the absolute latest technology available in a product that costs this much. Stay tuned for a full review to see just how much that matters this time around.